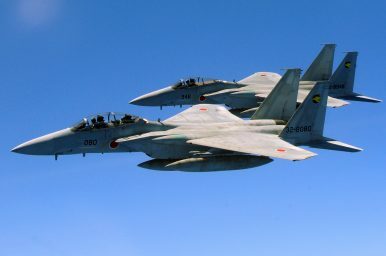 Total Air Self-Defense Force scrambles dropped slightly from 2016, but Japan remains concerned. The Japanese Ministry of Defense released new data concerning the scope of Japan Air Self-Defense Force (JASDF) activities in response to foreign aircraft approaching the country’s airspace. According to the new data, “unusual” flights by the Chinese People’s Liberation Army Air Force (PLAAF) near Japanese air space increased in the first half of the 2017 fiscal year. These “unusual” flights included unprecedented PLAAF exercises and drills through international air lanes through the first island chain, including the Miyako Strait. The Japanese Ministry of Defense also pointed to the presence of Chinese unmanned aerial vehicles in the East China Sea, where the two countries have a long-running territorial dispute over the Senkaku Islands, which Japan administers but China claims as the Diaoyu Islands. China has based its BZK-005on Daishan Island in Hangzhou Bay near Shanghai since at least 2015 to facilitate surveillance of the East China Sea. Per the new data released by the Japanese Ministry of Defense, the JASDF also scrambled 561 times in response to aircraft. This number was slightly lower than the record-setting figures released last year, but is greater than figures for this period in any year except 2016. Per data released in April 2017, the JASDF scrambled jets 1,168 times in 2016, up from 873 in 2015, in response to Chinese jets. In recent years, more JASDF fighters have scrambled to meet Chinese aircraft than Russian aircraft, which used to trigger the most responses from Japan’s air forces. Tensions between Tokyo and Beijing remain high over the East China Sea. In 2013, China declared its own air defense identification zone (ADIZ) over large swathes of disputed space in the East China Sea. Though the PLAAF has not uniformly enforced the ADIZ since the 2013 declaration, the PLAAF, along with the People’s Liberation Army Navy (PLAN), has increased its presence in the East China Sea more broadly as the Chinese military regularizes its operations and exercises across the first island chain. In December 2016, for the first time ever, the PLAN’s lone operational aircraft carrier, the Liaoning, transited the first island chain to enter the Western Pacific. The PLAAF has started conducting regular transit exercises into the Western Pacific to extend its military presence. Several types of Chinese military aircraft transited the strategically important strait.